As a routine, a new member join us need to experience what is the feeling of dry needle, so that she can appreciate what is the feeling of a patient who is having dry needling treatment. From the expression of Shuhada, the needle causing some ‘ lenguh’ sensation to the area needled, and the feeling last a while even the needle was removed, but the sensation is acceptable for her. 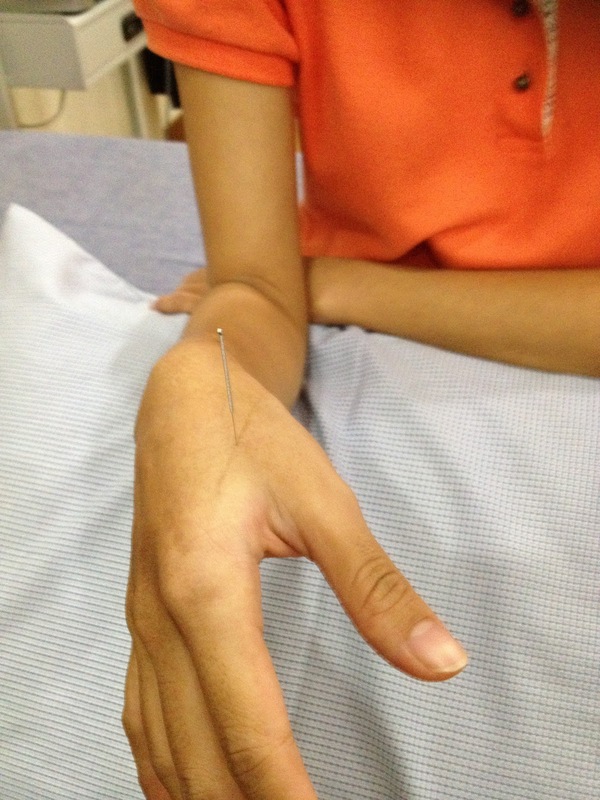 The point that the needle inserted on the hand was LI 4 or Large Intestine 4, in Chinese ‘he gu’(合谷 ). It is a usual point used for pain relieving. It is believed that if you have headache or stomach ache, this point can be press by finger to help relieve pain. How long are the needles used in dry needling technique? 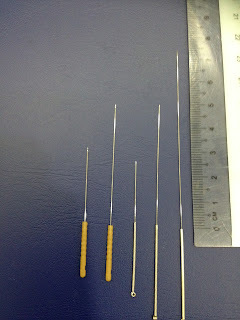 The commonly use acupuncture needles range from 2.5cm(1 cun or 1 inch), 5cm(2 cun or 2inches) to the longest 7.5cm( 3cun or 3 inches). 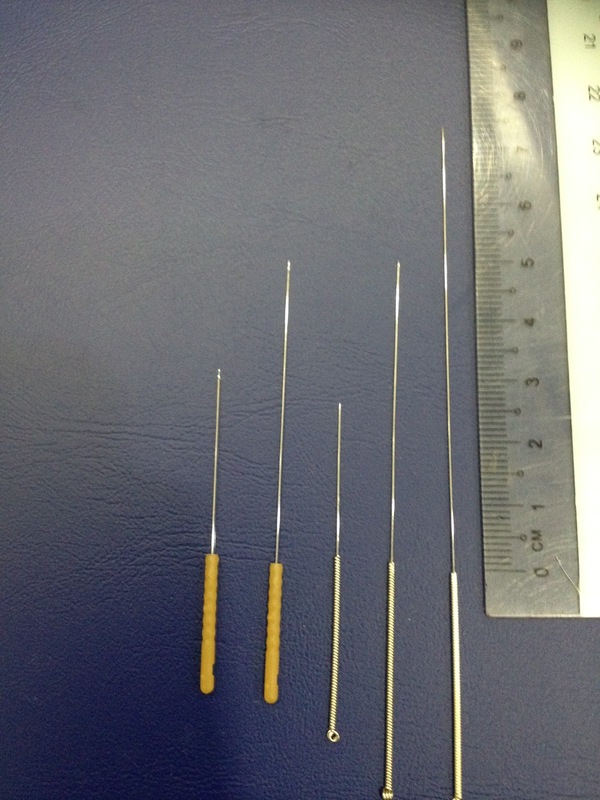 Which types of needles need to use are depend on the body part. If it is over the forearm, bottom of the leg, than 1 inch needle are being used. For deeper or thicker area, example, thigh, low back, the 4cm and 5cm needles are commonly used, and the longest needle (7.5) are used over buttock region, which the fat and muscles are so thick and massive, it can never be reach if we are using the short 1 inch needle. What exactly the needles can do to a person and how it helps them? Simple to say, when a needle inserted into the body, it traumatised the area and the human body will percept it as an injury, which it will started to bring more blood to the region for repair. When there are more blood circulation over the region, it relax the muscle which is originally tighten up(spasm or cramp feeling) due to injury. At the same time, the message of this injury will be convey by our sensory nerve to the spinal cord. The message or the signal of the needle fill the spinal cord sensory area(posterior horn) and causing others signal being blocked to enter into the spinal cord (pain gate mechanism), and it help to reduce the original pain of the patient. When the needle message being further carry up to the brain, it stimulate over an area in the brain, Pituitary to release ‘happy hormone’ such as endorphin and encephalin to increase the pain threshold of a person. Yikes! Not sure I'd want this myself but my cousin had so work done for physiotherapy in Waterloo but not sure that's my thing! Well, if it's not because of the wonder it can make from the needle, I believe there wouldn't be so many people, spending their time for all the scientific research on this topic. By the way, the needle is super fine, it's only 0.3 mm in diameter, smaller than injection needle, and the sensation is totally different from injection. Physiotherapy is exercise and massage and other modalities.It use when you get rest or relax. Physiotherapy is a one kind of health care to take care of your health.I have found a source that help me and it can be help you. Hey tanks for your physiotherapy idea,I have read the blog idea. I know many thing about the physiotherapy.The blog is very follow able.